MANILA, Philippines - NBA superstar Stephen Curry has arrived in Manila on Saturday morning, September 5, for a quick, one-day visit as part of Under Armour's five-city, three-country show. 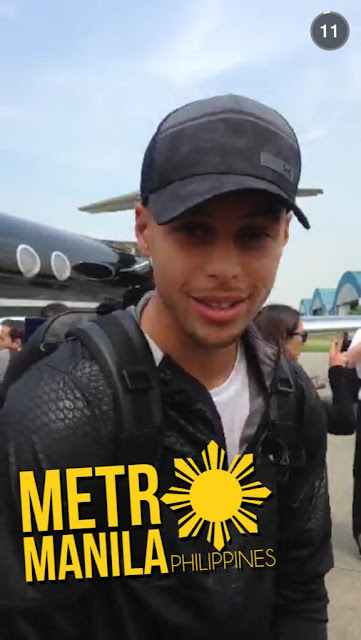 The reigning NBA MVP who helped fuel Golden State Warriors to this year's NBA championship landed in Manila before 10 a.m. He fly-in from Tokyo where the road show kicked off yesterday. What’s going on Manila??????????? The #UARoadshow is finally here. Can’t wait to see you guys and have some fun today. Reports said that Curry has chosen the Philippines to be part of his five-city Asian tour because of the country’s reputation as a hotbed of basketball. The Warrior star is set to hold a press conference at the Raffles Hotel in Makati City at noon and will grace some activities as part of endorsing Under Armour for avid Filipino basketball fans at the Mall of Asia Arena (MOA) in Pasay City. "This will be an unforgettable experience and we have some special things planned for some of the best basketball fans in the world," Curry said. After a quick tour, Curry will be heading to China on Sunday with stops in Beijing, Chongqing and Shanghai. This is the first visit of Curry in the Philippines. He joins some of the NBA players who have visited the country in recent weeks, among them, Lebron James (Nike), Danny Green of the San Antonio Spurs, Kenneth Faried of the Denver Nuggets, Paul George of the Indiana Pacers (NBA 3X 2015) and Ricky Rubio of the Minnesota Timberwolves (Adidas).